The QUESTemp° 34 is a rugged, easy to use, datalogging Thermal Environment Monitor. 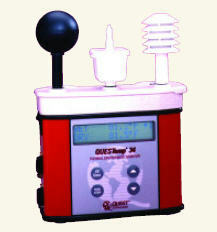 The QUESTemp° 34 is the datalogging version of the QT32 Thermal Environment Monitor. Output recorded data directly to a serial printer or download to QuestSuite Professional software, "The System Solution" for storage, retrieval, analysis, reporting, and charting of all your heat stress monitoring data. UL/CSA Standards for Class i, Groups A, B,C & D; Groups E, F & G; Class. Temperature Code T3 & European Standards for EEX ia IIC, T3.